Dave saw this in a boardwalk arcade in Cape May, NJ. 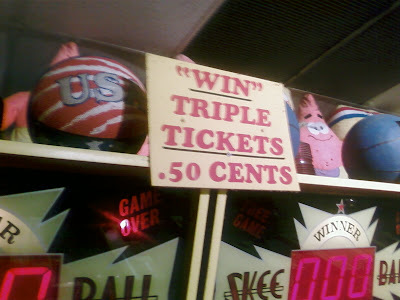 I guess I don't really consider taking home some crappy arcade prizes winning either. I like that they have tickets for a half cent each. I'd lay down a dollar and demand 200 of them. Someone could start a new blog of unnecessary "decimal points."